DES PLAINES, IL — A brief tool assessing emergency department (ED) threat perceptions has clinical utility for providers to identify patients at risk for developing cardiac-induced PTSD and is critical to inform research on whether threat may be modified in-ED to reduce post-traumatic stress disorder (PTSD) incidence. That is the finding of a study to be published in the October 2018 issue of Academic Emergency Medicine (AEM), a journal of the Society for Academic Emergency Medicine (SAEM). The lead author of the study is Talea Cornelius, PhD, a postdoctoral research scientist at Columbia University Medical Center in the Center for Behavioral Cardiovascular Health, New York. 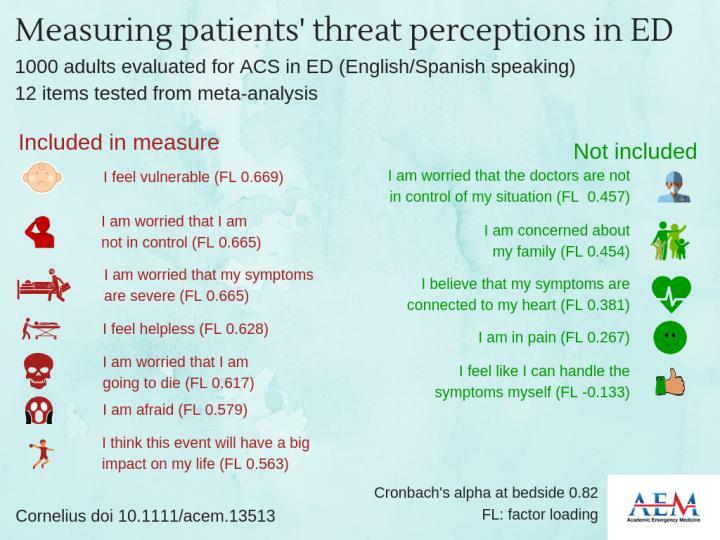 The study, by Cornelius, et al., reports the development and validation of a brief, self-report, seven-item measure of ED threat perceptions (e.g., patients' subjective feelings of helplessness or lack of control) in English- and Spanish-speaking patients evaluated for acute coronary syndrome (ACS). In addition to providing a foundation for standardized research programs across protocols and disease contexts, the study suggested that the brief assessment could inform clinical interventions and has practical implications: the ability to identify at-risk patients at an early point of contact in the ED and provide appropriate and targeted support to improve patient outcomes. Further, the study showed the feasibility of administering this instrument in the acute care setting. "Perceived stress and powerlessness are well-established risk factors for poor functional and psychological resilience among those who have witnessed trauma (e.g., community violence, military combat.) When one experiences the trauma of emergency treatment for a life-altering condition in a seemingly-chaotic setting, the psychological impact of such is rarely addressed at point-of-care. This study offers an invaluable instrument that aligns with the goals of Social Emergency Medicine; specifically, the need to assess and address plausible determinants of resilience before discharge from the ED." The findings of the study are discussed in the most recent AEM podcast, Threat Perceptions in the ED. SAEM is a 501(c)(3) not-for-profit organization dedicated to the improvement of care of the acutely ill and injured patient by leading the advancement of academic emergency medicine through education and research, advocacy, and professional development. To learn more, visit saem.org.